"Show don't tell" is one of the great Hollywood maxims. The antithesis of this would be Danny Dyer, in Nick Love's The Business, telling the audience, by way of exposition, that one of the antagonists was "so hard even his shadows were afraid of him". Ultimately, this means nothing to the audience on an emotive level. The equivalent would be replacing the silent montage of a couples life together, the heartbreak and sorrow, the love and loss of love, the tragedies and the silent dignity, in Pixar's Up with a throwaway line by Carl stating "I had an interesting life and loved my wife". It would mean nothing to the audience. 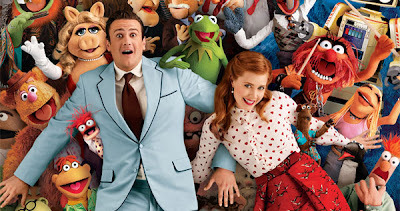 The Muppets begins with one of film's very best "show don't tell"s. Walter and Gary (Jason Segel), two brothers from Smalltown, are both huge fans of the Muppets in their youth. The two are shown growing up together watching their favourite TV show together, soaking up the radiance and joy of Kermit and the gang and growing in enthusiasm for their love of the chaotic show. Gary's wide eyed face emits earnest joy and it is through the brothers recollections of their time growing up that the audience get acquainted, or re-acquainted as the case may be, with the furry puppets and what exactly they stood for and what they mean to their fans. By the end of this sequence I was left convinced that I too had a deep emotional connection with The Muppets also. And if Walter wanted more than anything to go visit them then I wanted nothing more than to go along with him on his journey. 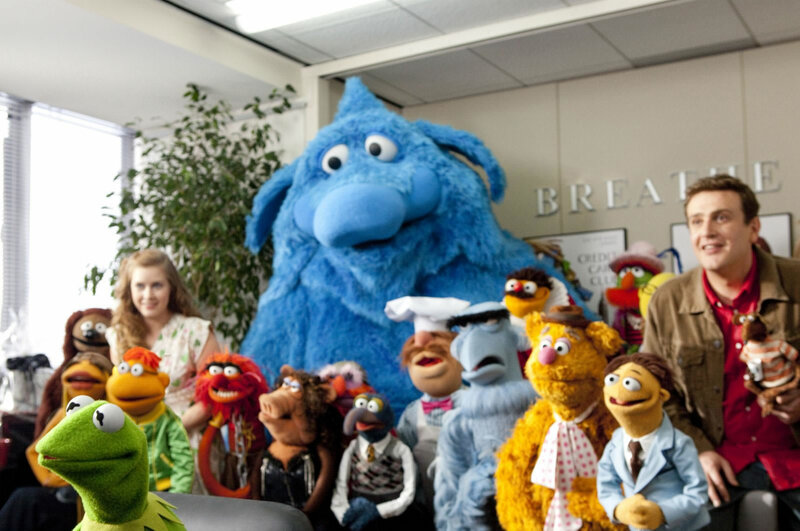 I, like Walter, was hooked and i wanted to know just what exactly has happened to The Muppets since their heydey? What are the old gang up to? The old gang, it would seem, are not doing as well as the two brothers would imagine when they take a journey out to see them at their old studio. Accompanied by Mary (Amy Adams), Gary's childhood sweetheart and incredibly patient fiance, the brothers are mortified when they arrive at The Muppet Theatre and find it has been sold to oil tycoon Tex Richman (Chris Cooper) and its former performers have relocated to pastures anew - Kermit resides in his Hollywood mansion miles away from Miss Piggy, now a succesful journalist at Paris Vogue, and Animal who resides in Anger Management therapy with Jack Black (Jack Black). When a plot is overheard with what Tex plans to do to the old Muppet Theatre it becomes apparent there is only one course of action for the brothers - and that is to get the team back together in time to raise enough money, in the form of a telephon, to buy back the premises and halt Richman's villainous plans. The film has an unbridled generosity of spirit and it must surely be impossible to not get swept up in the joyous waves it emits. Rarely is movie-watching this unadulterated in its euphoria. At the start of the film I found out that The Muppets were Walter's heroes. By the end, I realised they are mine now too. * As a post-script, I'd like to note that, as a fan of George Albert Smith, the nodding reference to his 1899 masterpiece The Kiss in the Tunnel, was a sheer delight. It's amazing - can't recommend it highly enough!